Mites are very tiny parasites and, for your dog to have them, he must have had direct contact with another pet infested with the parasites. 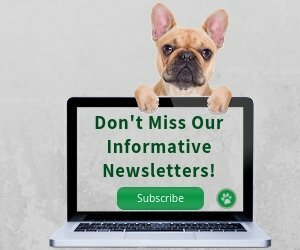 The most common form of mite that infects dogs is the Otodectic mite (Otodectes cynotis). Ear mites usually live in the ear canals and head of dogs. Specially, they live on the skin surface in the ear canals and feed on debris from ear secretion. Sometimes the mites may also migrate to the dogs' bodies. When this happens, the dog infested with mites will develop itchy spots on his back, neck and tail areas. Canine ear mites have a three-week cycle and can survive off the host for several weeks. Ear mites are more common in puppies, although they can be present in dogs of all ages. Suspect ear mites if both of your dog's ears are involved. The symptoms above resemble other ear problems such as yeast infection. If your dog shows the above symptoms, it is important to take him to the vet for a proper diagnosis. 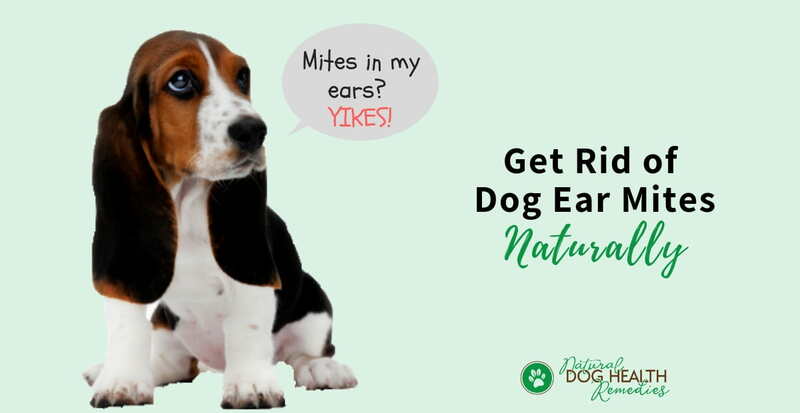 Mite infestation can cause outer ear infection in dogs, and can even cause permanent damage to the ear canal or ear drum, resulting in hearing loss. You can try to confirm mites by removing some waxy discharge from your dog's ears and, using a magnifying glass, look for some white specks that move. Alternatively, put the waxy ear discharge on a white sheet of paper, or kitchen paper towel, and add a few drops of hydrogen peroxide. If you see some brownish red stains on the paper, your dog most likely has mites. The stains are actually digested blood from the ear mites. Of course, to get a definitive diagnosis, you need to take your dog to the vet for a microscopic examination. Conventional treatment for dog ear mites may involve the use of a miticide or a flea control product (e.g. Revolution). If your dog has an ear infection caused by the mites, your vet may also prescribe antibiotics or anti-inflammatory drugs (e.g. corticosteroids) to treat the infection. As in many other dog health problems, mite infestation is largely due to a dog's weakened immune system. Dogs with a properly functioning immune system are less likely to be bothered by mites. strengthen the dog's immune system. A simple way to get rid of dog ear mites is to use mineral oil to smother and kill the mites. If your dog has mites, simply use an eyedropper to put 2 to 3 drops of mineral oil in each ear. Also wipe the inside of each ear flap with a cotton ball soaked with mineral oil. Then gently massage the whole ear in circular motions to evenly distribute the oil in the ear. Repeat 2 times per week for about a month to make sure that all mites are eradicated. Be sure to clean out the ears each time before applying the mineral oil. If you prefer to go the natural way, consider herbs. Herbs are also effective in cleaning the ears and getting rid of the mites, but it may take a bit longer to work. 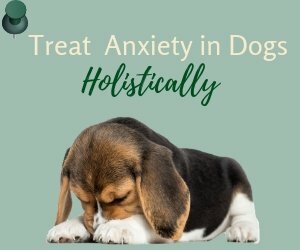 Mullein and Garlic Oil: The antimicrobial and antiviral properties of mullein make it an excellent herb for treating ear infections caused by mites in dogs. Garlic is antibiotic; when used in combination with mullein, it is also effective for treating ear problems. To make a mullein and garlic herbal remedy for ear mites, simply combine equal parts of mullein oil and garlic oil. Then to every ounce of this oil mixture, add ten to twenty drops of pure olive oil (or vitamin E). Mix well. Apply this oil mixture to the ear canal of your dog and gently massage the dog ear. Alternatively, you can also get a ready-made Mullein/Garlic oil product from a health food store or online. Calendula and Olive Oil: Calendula oil has antibacterial, antifungal, and anti-inflammatory properties. It is extremely skin soothing and healing. Add 2 ml of calendula oil (about 2 dropperfuls) to 8 tablespoons of olive oil. Mix well. 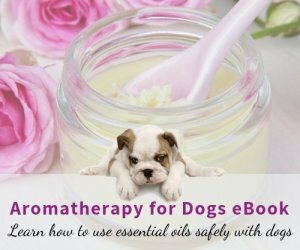 Use a dropper to apply 3-4 drops of the oil mixture to the inside of the dog's ear and gently massage the ear. Repeat twice daily. Oregon Grape: The strong antibiotic and antibacterial properties of Oregon grape makes it an effective herb for treating ear infections or mites. Use an oil infusion of the herb. Apply 1-10 drops at a time in each ear once or twice daily. 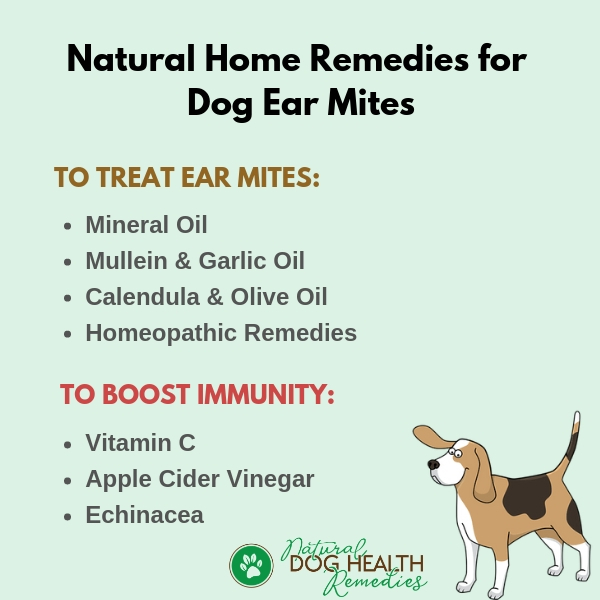 Homeopathic remedies can also be used effectively to treat ear mites in dogs. If you want to use homeopathic treatment, ask a holistic vet about the use of Apis, Pulsatilla, Sulphur or Silicea. This homeopathic remedy contains Apis, Pulsatilla, Echinacea, etc. and is effective in relieving symptoms of mites, minor ear infection, redness, swelling, and pain. In addition to eliminating ear mites, it is essential to use herbs and/or dietary supplements to strengthen your dog's immune system. Parasites tend to affect weak hosts more so than strong hosts. Vitamin C: Vitamin C is an antioxidant and can be given internally to help the immune system clear up ear infections caused by mites. Apple Cider Vinegar: Alternatively, you can add a splash of organic apple cider vinegar in the dog's drinking water. Echinacea: Echinacea tablets, tea, or tincture can be given to your dog to strengthen her immune system. Before ear mite treatment can be effective, you need to clean out all the debris in your dog's ear canal. Visit our page on Cleaning Dog Ears to see how to clean your dog's ears properly. When treating dog ear mites, bear in mind the life-cycle of ear mites. Treatment may have to be repeated at intervals for approximately three to four weeks to completely get rid of the mites. As ear mites are highly contagious, you need to treat all the pets in your family even if they show no symptoms of infestation. Ear mites can quickly re-infect all the pets in the house if one is left untreated. As mentioned above, dog ear mites can cause ear infections. Therefore, after treating your dog's ear mites, you may still find that your dog is troubled with an uncomfortable and sore ear. In such a case, be sure to consult your vet to determine if your dog is indeed suffering from an ear infection. If so, the ear infection will of course need to be treated accordingly. 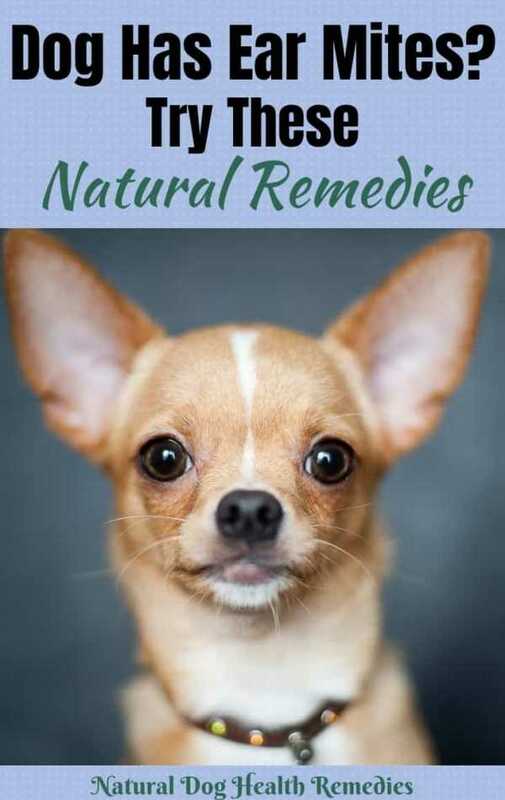 See also our page on Remedies for Dog Ear Infections for some herbal ear wash remedies for dog ear infections.